Ancient and weathered it stands like a sentinel at the gates of another realm. Seen from the foothills of the piedmont, the Blue Ridge Escarpment rises suddenly to divide the land, allowing passage through only a handful of mountain roads. 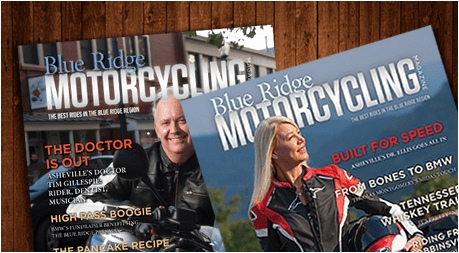 Savvy motorcyclists gather along these roads to experience the sudden 2,000-plus climb over the Eastern Continental Divide into Western North Carolina. Some of the roads take riders past popular attractions, some just snake through a lonesome, rocky forest. “There are roads that hardly anybody travels. They’re obscure, you’ve got them to yourself most of the time. As you can see, the scenery is second-to-none,” said Vincent J. Valdes of Table Rock, S.C., as he gestures to the towering mountainside from the base of the escarpment in South Carolina. Valdes frequently rides his ’15 Kawasaki KLR along the mountain range, seeking cliff-hugging asphalt and a few out-of-the-way gravel roads. “It drops, on average, about 2,000 feet. It runs pretty much the length of the Blue Ridge Mountains itself, which begins in Virginia and runs to Georgia or to Alabama depending on who you talk to,” said Tim Lee, the interpretive ranger and naturalist at South Carolina’s Caesar’s Head State Park and the Mountain Bridge Wilderness Area. 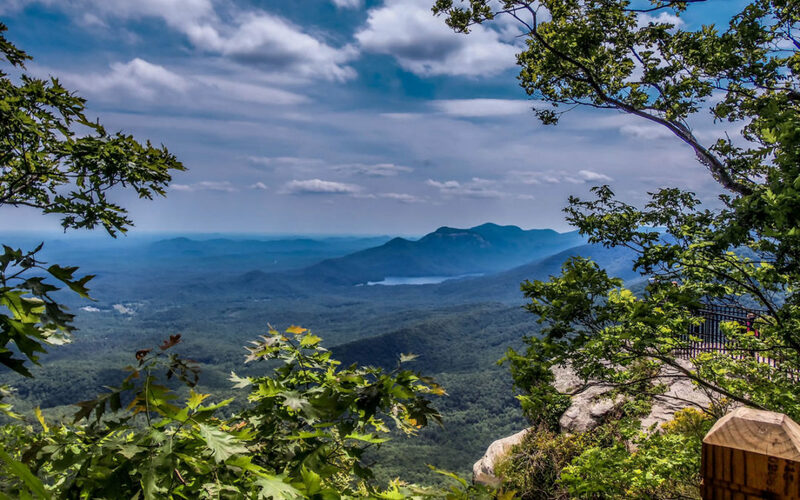 Caesar’s Head, elevation 3,215 and just 15 miles southeast of Brevard on U.S. 276, attracts motorcyclists who stop at the popular destination to enjoy 180-degree views of Table Rock and much of Upstate South Carolina. They also flock to the state park after a spirited run up 276, with its sharp switchbacks and steep elevation changes. An uplift from plate tectonics formed the impressive wall of mountains millions of years ago, and they were much higher than they are today. They’ve been eroding away ever since, Lee said. “One of the theories as to why the escarpment is so sharp along here is because an ancient ocean crashed upon the mountains and weathered it away,” the ranger said. Eons later, humans followed game trails and gaps in the towering hills to create a series of north-south roads crossing the Blue Wall. Each of these roads offer a unique riding experience. Walking out onto the stone cliff-face overlook, a panoramic vista of Upstate South Carolina unrolls before you. A steady breeze eases the summer heat as even the wind must bend for the rugged escarpment. “About every thousand feet you come up, it gets about 3-degrees Fahrenheit cooler, which is the equivalent of traveling about 300 miles north of here. The climate you find here is about what you’d find in central Pennsylvania,” the park ranger said. As visitors grapple with which direction to admire first, a bird of prey silently turns lazy circles in the hollow just to the west. Catching the wind, the hawk takes just a few seconds to effortlessly soar over the distance that a hard-riding motorcycle group just covered amid a roar of pipes and occasional scraped peg. The Blue Ridge Escarpment offers outdoor enthusiasts a bounty of natural wonders. For those who enjoy hiking, a two-mile trail in the Mountain Bridge Wilderness Area from U.S. 276 brings explorers to one of the Blue Wall’s other stunning qualities – a towering waterfall. The slightly taller 411-foot Whitewater Falls, about 40 miles west of Raven Cliff, is much easier to access with its paved walkway from a nearby parking lot off N.C. 281, also known as S.C.130 below the state line. Both waterfalls require a small access fee. Dropping down the escarpment along the southern portion in South Carolina, a collection of backroads nestled at the base of the mountains begs riders to slow for a leisurely, scenic cruise. Heading toward Table Rock, Victoria Valley Vineyards — just down from Caesar’s Head on Saluda Road — makes an excellent spot to stop for lunch and maybe enjoy a glass of locally produced boutique-style wine. “Somedays we will get eight to 10 bikes pulling in at a time. I love that sound,” said Brittany Jaynes, who helps manage the family-owned vineyard and café. Victoria Valley Vineyards often hosts motorcycle and car clubs for events, as well as serving as an event center for weddings and other gatherings. The café features as open-air patio that overlooks the rows of vines trailing back toward the mountains. From Thursday to Sunday they serve a full menu before 3 p.m. and appetizers until closing. Joe Acampora, originally from Connecticut, now lives in nearby Table Rock. He spots the motorcycle out front and strikes up a conversation with a fellow rider. 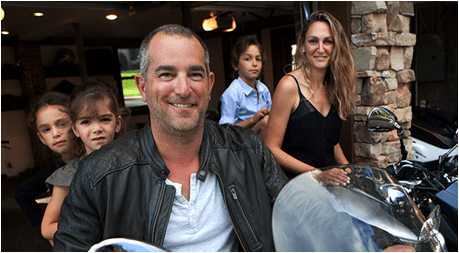 Acampora owns four Triumphs, including a pink Speed Triple that his wife rides. Victoria Valley is one of his favorite spots. “The food here is excellent. It’s off the beaten path, not a lot of people know about it,” Acampora said. Living next to the escarpment, he frequently enjoys the ascent up the Blue Wall. Several roads ascend the southern portion of the escarpment, attracting riders from both Carolinas. Some provide more technical switchbacks, some a leisurely cruise but all offer stunning natural beauty and the kind of riding that makes motorcycling such a transcendent experience. It’s possible to tour them all in one day, but there’s no need to rush. With several nearby towns for lodging, riders can spend a weekend exploring the natural wonders and scenic roads that make the Blue Ridge so special. Linking up all the best routes requires retracing one’s ride since most of the roads run parallel in a north-south direction, but experiencing such roads twice just doubles the fun. There’s no need to rush to ride them all in one day. The mountains have waited for millions of years. They’ll still be as stunning on your next two-wheeled pilgrimage. U.S. 74A AND THE HICKORY NUT GORGE: Known as the old Charlotte Highway, U.S. 74A runs southwest out of Asheville to join U.S. 64 in Rutherfordton. 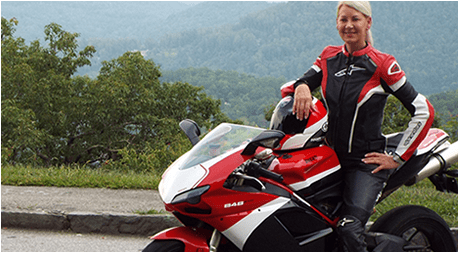 As most motorcyclists can attest, the ride uphill can be more enjoyable, so these route descriptions approach the escarpment from the piedmont. From the west, the road follows the Broad River as it flows out of Lake Lure. Travelers hug the western edge of the lake as they travel up the gorge. On the left, towers Chimney Rock, the iconic monolith from which visitors atop the landmark enjoy stunning views. This road proves popular with motorcyclists, who can stop and enjoy the many shops, restaurants and Chimney Rock State Park. The highway climbs through the Hickory Nut Gorge and crests the Eastern Continental Divide, which runs along much of the escarpment from Virginia to Georgia. The gorge offers views of rugged cliffs and the 400-foot Hickory Nut Falls, one of the highest waterfalls east of the Rockies. The section nearest the crest of the mountain is the most technically challenging with a series of hairpin turns descending into the valley southeast of Asheville. In summer, the northern side of the ridge offers a cool, green escape from the heat. Continuing north brings riders to the Blue Ridge Parkway near Interstate 40 just 23 miles from Lake Lure. This makes a good starting point for riders traveling out of Asheville and descending the escarpment. THE SALUDA GRADE AND U.S. 176: Starting in the quaint town of Tryon near the border with South Carolina, riders should head north on U.S. 176 toward Saluda. This road climbs the escarpment through the Pacolet River Gorge and next to the famed Saluda Grade, the steepest standard-gauge railway rage in the United States. The two-lane highway features sections lined with rocky cliffs and nearby waterfalls including Pearson’s Falls a short distance from U.S. 176. The 90-foot waterfall and surrounding woodlands is privately owned by the Tryon Garden Club. A modest admission fee grants travelers access to the botanical preserve. From the park, dual sport and adventure riders can climb the gorge along the gravel Pearson’s Falls Road for a more rugged and secluded ride. A spirited run up the mountain on this route is aided by passing lanes for overtaking slower traffic. At the top awaits the town of Saluda nestled next to the railroad tracks. Drop the kickstand and wander Main Street to take in Pace’s General Store, Thompson’s Store and Ward’s Grill, all historic businesses dating back to the 1800s. POINSETT RESERVOIR on OLD U.S. 25: Progress marches on and motorists often forget the winding old roads that originally cut their way through the mountains. Following one of the oldest paths across the escarpment, Old U.S. 25 now attracts mostly bicyclists and recreational traffic. Also known as the North Saluda Reservoir, this watershed north of scenic S.C. Highway 11 provides drinking water to Greenville, South Carolina. On Callahan Mountain Road just below the reservoir stands – as it has since 1820 – the Poinsett Bridge. The oldest remaining bridge in South Carolina, the stone span features a narrow gothic arch over a small stream in a densely wooded hollow. Some claim it’s haunted. Ghostly figures appear at night crossing the bridge on an ethereal journey. Callahan Mountain Road meets Old U.S. 25 at an acute angle. Turning north, the distressed pavement follows the lake, which holds several small scenic islands. Alas, since it passes through a protected watershed, no stopping is allowed on the journey up the escarpment. Try to not ride off the road enjoying the view. The old highway, once part of the Carolina route of the Dixie Highway, features a few banked turns as it snakes its way up the escarpment in North Carolina and eventually reuniting with the modern four-lane U.S. 25 south of Hendersonville. CAESAR’S HEAD and U.S. 276: For a few miles near Cleveland, South Carolina, U.S. 276 runs along S.C. 11, also known as the Cherokee Foothills Scenic Highway. Following the base of the escarpment, Highway 11 offers the best access to many of the roads climbing the ramparts of the Blue Ridge Mountains. U.S. 276 veers north on Geer Highway to twist its way up to Caesar’s Head State Park and the Mountain Bridge Wilderness Area. Nearly halfway up the mountain, a pull-off area offers riders a spot to explore Bald Rock Heritage Preserve. This large, flat outcropping of rock features views nearly as good as Caesar’s Head above and makes a great spot for a roadside break. Along the route are few short passing lanes, many of them in the middle of a few sharp turns. It may take a bit of nerve and confidence to overtake if traffic is heavy. Atop the escarpment, Caesar’s Head State Park usually bustles with visitors, many of them on two wheels. The gift shop tempts you take home a souvenir and of course the view from the rock never fails to imprint a lasting memory. The curves are tight and the ridings waiting at the summit are usually welcoming. TABLE ROCK STATE PARK to U.S. 178: A few miles west of Caesar’s Head accessible only from S.C. 11 looms the stunning granite dome of Table Rock. The visitor’s center sits across the road from the entrance to the park. The center features restrooms, a gift shop, and a porch overlooking a small pond where motorcycle travelers can relax and admire the upwelling of the Blue Wall. The visitor’s center is free and offers an excellent view of the rock, but entering the park requires paying a small admission fee. The park features cabin rentals, a campground, hiking trails, two lakes and a swimming hole. If the riding thrills you more than the sight-seeing, continue west to U.S. 178. A small convenience store on the intersection of highways 11 and 178 usually attracts motorcycle riders touring the Cherokee Foothills Scenic Highway or preparing for a run up 178. 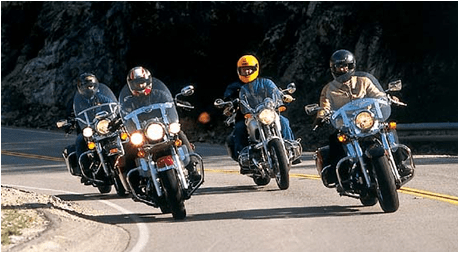 All tribes converge – tourers, cruisers and sport bikes. From this crossroad, each compass point offers a different riding experience. U.S. 178 climbs the escarpment and into Rosman. About halfway up the mountain in the middle of a sharp turn lies Bob’s Place, a classic roadhouse biker bar displaying a weathered Pabst Blue Ribbon beer sign. Cold beer and live music fill the clapboard shack, which locals say is the oldest continuously operating beer joint in South Carolina. Some challenging turns ahead bring riders to Rocky Bottom, where a side trip up Sassafras Mountain leads to the highest point in South Carolina and another stunning view from the escarpment. LAKE JOCASSEE and DEVIL’S FORK STATE PARK: Another excursion from S.C. 11 worth exploring takes riders up Jocassee Lake Road to Devil’s Fork State Park. On a cloudless summer day, the clear mountain waters of this manmade lake almost hurt your eyes with its blue brilliance. Like all of the South Carolina state parks along Highway 11, the facilities are clean, modern and inviting. The lake nestles against the escarpment. In the distance along the northeast shore sits Jocassee Gorges State Park and a pristine wilderness. Several scenes from the 1972 movie “Deliverance” were filmed here during construction of the lake. One famous scene featured the Mount Carmel Baptist Church Cemetery. Today, a few gravestones remain standing beneath nearly 130 feet of water. For a fee, boat tours of Jocassee offer an excursion to explore the crystal-clear lake and Laurel Fork Falls, a triple-tiered 80-foot waterfall on the opposite end of the lake from the visitors center. BAD CREEK RESERVOIR/WHITEWATER FALLS: Heading north from S.C. 11 on highway 130 takes riders to another man-made lake above Jocassee, the Bad Creek Reservoir. Operated by Duke Energy, the hydroelectric station stores water for use during peak energy demands. Several trails and an overlook are open to the public during daylight hours. Just south of Bad Creek, a detour to the west on Wigington Road brings you to a roadside overlook with views of both lakes. The road also serves as a shortcut to N.C. 107, another wonderful road crossing the escarpment. Continuing into North Carolina on N.C. 281 passes the parking lot for Whitewater Falls. Wildfires last year damaged the lower steps, but the upper overlook is easy to access and the views are still as stunning. Following N.C. 281 north leads riders to U.S. 64 in the community of Sapphire and nearby Lake Toxaway. U.S. 64 crosses the top of Toxaway Falls, and a pull-off area allows a modest view of the upper part of the cascade. MOONSHINER 28: This legendary road begins on S.C. 11 below the escarpment in Seneca, S.C., and crosses three states to end at Deals’s Gap along the famed Tail of the Dragon. Just 7 miles north of Walhalla, stop to see the Stumphouse Tunnel. This failed railroad engineering project began as an attempt to link Charleston with Knoxville in the mid-1800s. The Civil War and lack of funding doomed the project. The 1,600-foot tunnel offers a cool, damp respite from the heat of summer riding. Issaqueena Falls sits a short, easy hike away in the same park. Forking off Highway 28 a few miles north of Stumphouse Tunnel, N.C. 107 travels to Cashiers along a gently curving road up the mountain. If stair-stepped elevation changes and hairpin turns aren’t your favorite kind of riding, 107 allows for a more relaxed afternoon cruise. As Moonshiner 28 cuts the corner of north Georgia, Warwoman Road to the west offers a splendid route to Clayton, Ga. Warwoman features every type of riding, challenging switchbacks, rolling hills and relaxing straights through a scenic countryside. Staying on 28 north and you arrive in the mountain town of Highlands, N.C. This hideaway for the well-to-do features boutiques, cafes and several nearby waterfalls along U.S. 64 west. Don’t be surprised if you see a Ferrari, Lamborghini or other exotic car parked along Main Street.